witch one would do better in my situation? Last edited by PVT-Oliver[75thR]; 09-15-2004 at 08:22 AM. The other thing is FPS. There's little point in going over 72 FPS as you probably can't tell the difference, and there's absolutely no point if your monitor doesn't support a refresh rate of over 100MHz. Plus, that depends on what resolution and setting you run it at. I can pull way more than 100FPS on my P4 2GHz with a Radeon 9800 Pro if I run it at, say, 640x480. At the same, it would likely be unplayably slow at 1600x1200. To answer the question, PC3700 is the absolute minimum for someone who wants meaningfull overclocking on an 800MHz FSB Pentium 4. Even quality PC3200 won't overclock enough (although there is one type from OCz that overclocks amazingly well; look for "enhanced bandwidth" RAM). If you already own the board and CPU, get some good PC3700 or PC4000 and a good cooling system. Manually overclock and run the CPU and RAM at the same FSB. BTW, unless you have overclocked the video card well beyond XT speeds, this won't mean a damn, anyway. Sure, a 3.0E (or an Athlon 64 or 3.0C, for that matter) will mean a lot more performance than what you have now, but you'll need a new video card to get the kind of speed you seem to want. A 9800 Pro will hold that processor or a price equivelent back, a lot. 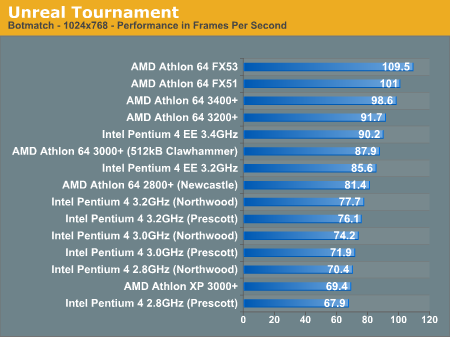 An OEM Athlon 64 3000 and aChaintech VNF3-250 would be in that price range and are much better for gaming. You'll want a heat sink/fan unit to go with that CPU and some thermal compound. For this, I'd recommend a Thermaltake Venus 12 and Arctic Silver 5. The Corsair you picked out would actually be perfect for this. You should be able to overclock it pretty far; at least enough to get the kind of performance you're going for. You can expect to run this between 220 and 230MHz (440-470DDR), which will allow a very good overclock for your processor without getting really expensive RAM. After that, you would have to replace the video card to get incredibly good performance in America's Army at high quality settings. You can sell that 9800 Pro for somewhere around $150, I'm guessing (it retails for $200). I'd suggest getting at least a GeForce 6800 (retails about $280), but an X800 Pro or GeForce 6800 GT (both around $400) would be even better, if you can afford it. With one of those three and this system, you could run AA at 1600x1200 with high settings and get great framerates.